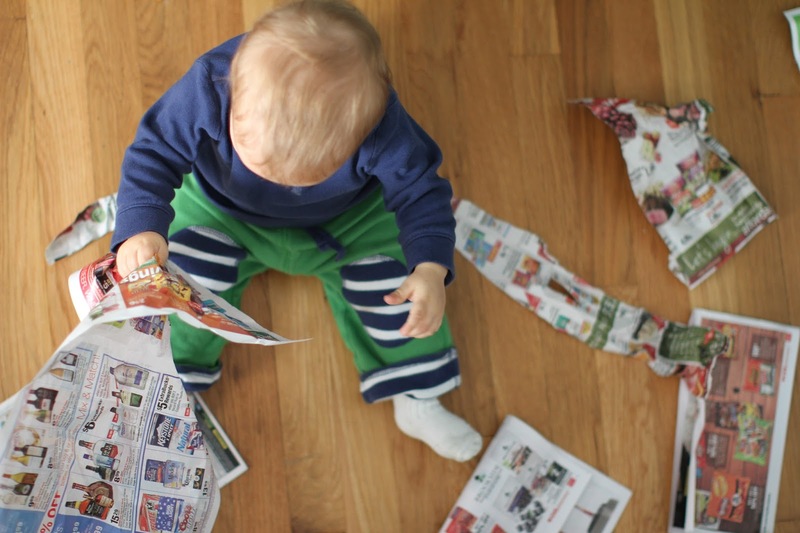 Who needs those fancy sensory play boxes from pinterest when you've got a newspaper around?! I mean seriously, who has time for that? I have some very dear friends that are all over that type of thing. And I am over here, scratching my head, wondering why I would spend the money, then have to store all that crap when my kid is just as happy throwing around a newspaper and wiping pureed food all over his high chair tray. I honestly do throw Callum a section of the newspaper to play with when I want to get some things done. It entertains him so long. And it makes him so excited. And he doesn't put that much in his mouth…I think. All these sensory play things make me think about how much pressure is on parents today to make sure our children have the perfect childhoods. Because they won't make it through college if they aren't exposed to enough sensory play as youngins ;) I'm pretty granola and simple about parenting. I way limit screen time. I am super into reading together. I love us all building legos together. And I absolutely love it when the kids get immersed in imaginative play for hours. Though sensory play boxes seem right up my alley, I also don't like to over think (or over spend) it too much. So there you have it, my simple thoughts on sensory play and keeping it simple.